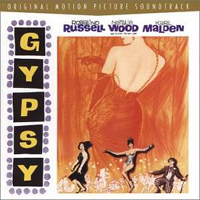 Film Soundtrack, 1962 (Warner Bros.lRhino-Turner) (4 / 5) It took a long time for the Gypsy soundtrack album to show up on CD, but this Rhino release proved to be well worth the wait. George Feltenstein did an excellent job of producing the disc and writing the informative notes. The recording was remastered, and the complete version of “Dainty June and Her Newsboys” is included. The biggest bonus of all is the added tracks of Rosalind Russell singing Rose’s songs, which were almost entirely dubbed for the film by Lisa Kirk. In Russell’s autobiography, she insists that she did all of her own singing in Gypsy, but that’s simply not true; only her vocals for “Mr. Goldstone, I Love You” and some sections of “Rose’s Turn” made the final cut of the film, but Kirk’s dubbing of the other songs is very skillful. In general, Russell acts the songs wonderfully well, yet her singing leaves much to be desired. However, in “Together,” which was cut from the movie, she sings delightfully, as do Natalie Wood and Karl Malden. Wood’s “Little Lamb” is touching if not pretty, and she sounds fine duetting with Ann Jillian in “If Momma Was Married.” As Tulsa, Paul Wallace recreates his Broadway performance of “All I Need Is the Girl.” The Broadway cast’s Faith Dane leads the strippers in “You Gotta Have a Gimmick,” and Malden handles Herbie’s minimal vocals well enough. This CD offers “Rose’s Turn” in two versions: the “album version,” which is all Lisa Kirk, and the film version, which is part Kirk and part Russell. The thrilling overture is conducted by composer Jule Styne. — J.D. 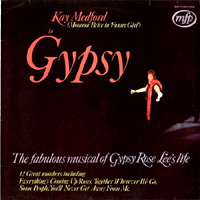 Studio Cast, 1969 (Music For Pleasure/no CD) (1 / 5) This is the oddest Gypsy recording of all. Kay Medford had played another showbiz mama, Mrs. Brice, in Jule Styne’s Funny Girl, so it may have seemed a good idea to give her a shot at Rose. Produced by Norman Newell and featuring something close to the original orchestrations, this recording was made in London. Its first quirk comes in “Some People,” when Medford sings a rarely heard lyric: “Some people can sit and stare, living life in a rocking chair.” Her sliding into notes here is regrettable, but then she begins to capture you with a “Small World” that’s nicely sung and well interpreted. Medford works hard in “Everything’s Coming Up Roses,” but her acting doesn’t compensate for her singing, especially not at the climax of the number. In “If Momma Was Married,” the Louise is boring while the June sounds very British and doesn’t sing too well. Tulsa, in ‘All I Need Is the Girl,” comes over like a London chorus boy rather than a would-be vaudevillian. The strippers are fine — but after all, “You Gotta Have a Gimmick” is almost indestructible. Finally, Medford’s “Rose’s Turn” is rather grim. — J.D. 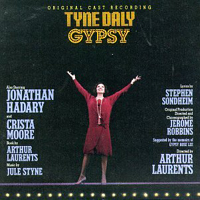 Original London Cast, 1973 (RCA) (4 / 5) London didn’t get to see Gypsy until 1973, when Angela Lansbury starred as Rose under the direction of the show’s librettist, Arthur Laurents. When the eagerly awaited cast album arrived on these shores, listeners were immediately taken with the star’s fresh approach to the character. Lansbury’s Rose was electric in a totally different way from Merman’s. 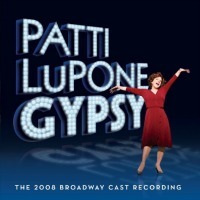 There were some revisions in the songs for this production; for example, “The Strip” (“Let Me Entertain You”) now has Louise/Gypsy speaking to the audience in addition to singing and changing outfits. Barrie Ingham, as Herbie, makes the most of his musical moments, and Zan Charisse is perfect as Louise. The vaudeville sequences have been telescoped into something called “Let Me Entertain You” (Montage) that gives us some of Bonnie Langford’s hilarious Baby June and some of Debbie Bowen’s Dainty June. On the LP, Lansbury’s tracks were a bit raw but amazingly vital; she was also the first Rose on record to sing the final note of “Some People” as written in the score, to thrilling effect. However, when the album was issued in the United States, it was apparent that Lansbury had re-recorded some of her solo tracks. Those performances, retained on the CD, are somewhat lacking in immediacy and excitement as compared with the others. Still, in both versions, Lansbury’s “Everything’s Coming Up Roses” is powerful, and her “Rose’s Turn” is classic. — J.D. Broadway Cast, 1990 (Elektra-Nonesuch) (2 / 5) Tyne Daly was reported to be having vocal problems when this album was made, but if that’s true, it doesn’t seem to have daunted her in the role of Rose. The recording includes some dialogue which enhances the enjoyment of her performance. Daly and Jonathan Hadary turn “Small World” into a gem of a duet. While Daly’s voice does show some signs of wear in “Everything’s Coming Up Roses,” the introductory spoken lines propel her into singing with a desperation that really makes the number land. Crista Moore is mostly good as Louise, but “The Strip,” in a newly rewritten version, is weak. The strippers — Barbara Erwin, Jana Robbins, and Anna McNeely — display loads of showbiz savvy in “You Gotta Have a Gimmick,” and Robert Lambert is a solid Tulsa. As for “Rose’s Turn,” it begins almost as a toss-off, but then Daly gradually gains intensity and growls her way to an almost defeated ending. — J.D. 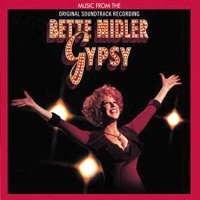 Television Film Soundtrack, 1993 (Atlantic) (3 / 5) The TV movie of Gypsy starring Bette Midler is textually faithful to the stage version of the musical. 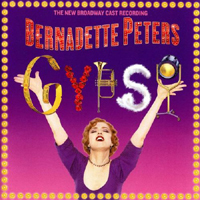 The production was controversial; many fans of the show had trouble accepting Midler as Rose, but hers is an estimable performance, and this soundtrack recording has much to offer. To start with, Michael Rafter does a fine job with the beloved overture — but now the quibbles begin. The recording includes almost no dialogue, although we do get to hear Ed Asner’s recognizable voice as Pop in “Some People.” The lack of spoken lines limits the dramatic impact of “Small World,” “You’ll Never Get Away From Me,” and “Together,” even if these numbers benefit greatly from the very pleasant presence of Peter Riegert as Herbie. For whatever reasons, much of what’s good about the film doesn’t translate to the soundtrack recordnig. Cynthia Gibb doesn’t make a strong vocal impression as Louise; her “Let Me Entertain You” is only saved by some voice-overs tracing her climb to Minsky’s. Also, neither “All I Need Is the Girl” nor “You Gotta Have a Gimmick” register strongly without the visuals. But then there is Midler. According to producer Craig Zadan’s notes, the star performed most of her vocals live. The spontaneity and verve that she brings to this classic score must be partly credited to that wise choice, one so rarely made when musicals are filmed. “Some People” bristles, “Small World” allows Rose to melt Herbie with a creamy vocal, and “Everything’s Coming Up Roses” is suitably scary. The glory of the disc is Midler’s superb “Rose’s Turn”; she acts her way through every moment of the number with enormous guts, bringing it to a searing climax. — J.D. 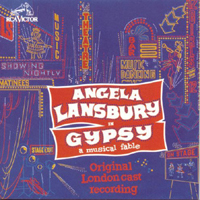 Broadway Cast, 2003 (Angel) (3 / 5) Whatever one may have thought of this production, the cast album was the most complete preservation of the Gypsy score to be found on a recording up to that time. Almost every track includes dialogue, and there is a great deal of incidental music and underscoring. Bernadette Peters’ Rose is as unique to her personality as her predecessors’ takes on the role were to theirs; she defines the character in her own special way. What comes through on the recording is her variance between charm (“Small World”), strength (“Some People”), vulnerability (the “Small World” reprise), ferocity (“Everything’s Coming Up Roses”), and grit (“You’ll Never Get Away From Me”). Peters skillfully juggles all these aspects of the role, finally allowing them to collide brilliantly in “Rose’s Turn.” Tammy Blanchard is not fully convincing as Louise in yet another version of the “Gypsy Strip,” nor is she very effective in “Little Lamb,” and she’s only a little bit better when singing “If Momma Was Married” with Kate Reinders. John Dossett and David Burtka are far more persuasive as Herbie and Tulsa, respectively. The three strippers — Kate Buddeke, Julie Halston, and Heather Lee — are right-on in “You Gotta Have a Gimmick.” — J.D. London Cast, 2015 (First Night Records) (2 / 5) The most praiseworthy aspect of Imelda Staunton’s performance as Rose is the quality of her singing from a purely musical standpoint. 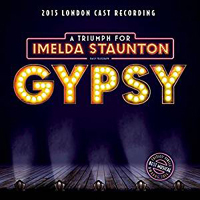 A live commercial video of this 2015 London production of Gypsy reveals a portrayal of the role that some have rated as strident, lacking in charm, and more “indicated” than felt. 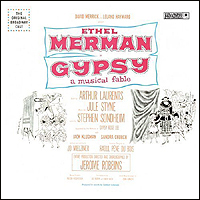 But on the cast album, which of course focuses on the show’s musical moments and includes not much dialogue, Staunton comes across much better. She also deserves credit for her well-done American accent, a few “anuhthings” and “everuhthings” aside. On that note, compared to the 1973 London cast recording with Angela Lansbury, the accent work of the ensemble here is generally far superior; the “newsboys,” for example, sound convincingly American, rather than like a bunch of urchins who wandered in from Oliver! The supporting cast is generally fine, especially Lara Pulver as Louise. But while the orchestrations for reduced forces are well done for what they are, a full string section is sorely missed at several points in the score, such as the phenomenal “Overture.” That’s a major disappointment of this recording. — M.P.